A CASE OF THE WHOOPSIES IN THE PANTSIES with Ashley Feinberg | Says Who? There's a lot to wrestle with these last couple weeks. There's the awful, heartbreaking news that came out of Parkland Florida. There's the surprise indictments by Robert Mueller. There's the continued awful sh*tposting from Trump in Florida. 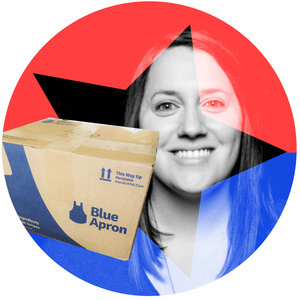 And then there's a news report that Maureen was perhaps born for: That the government is proposing creating a "Blue Apron-type program" to replace food stamps. How terrible an idea is that? Let Maureen take you there (if Dan will let her). In addition to struggling with the news, Dan and Maureen are joined by Ashley Feinberg, a reporter who has taken reading the Trump family social media accounts to a whole 'nother level. Who's dissing who through passive-aggressively forgetting their birthday? Just which Trump kid is the dumbest? Just what is going on with Trump's hair? We ask a literal, actual expert. Really! Hold on to something because it gets a little bumpy. It's the new Says Who! Ashley Feinberg is a is a Senior Reporter at HuffPost based in New York. Previously, she was on Gizmodo Media Group’s investigative team, and before that she was at Gawker. Ashley's investigation into Donald Trump's weave. Get your Pee Tape and Robert Mueller prayer candles and stickers! and you never knew you wanted a Pee Tape Prayer Candle until right now. So go back the project!